Aaaaand this is recipe # 3 of Oster Kitchen Conversations with Patty Laurel-Filart and Sinfully Sabrina. 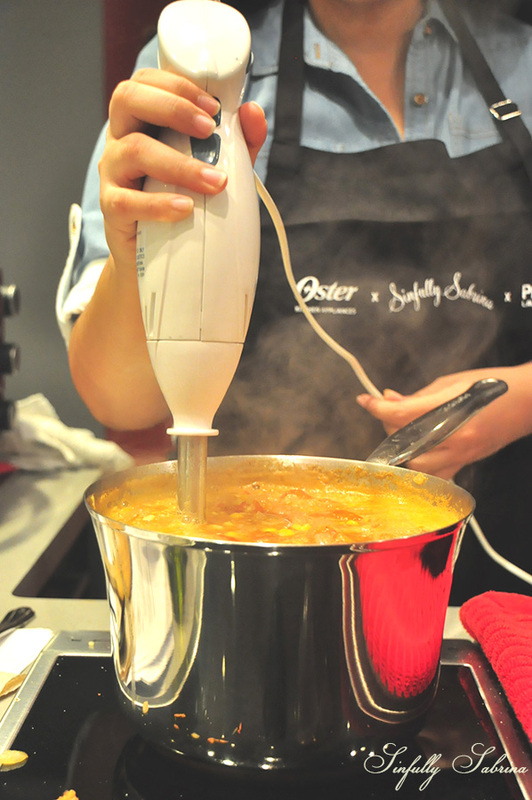 Here I am using Oster's Stick Mixer with Chopper to make our chowder in between smooth and a little bit chunky. As a bonus tip for my girlfriends, I taught them how to make Parmesan crisps using the Oster Double Contact Grill. It's non-stick and easy to clean! I used the crisps as garnish for the chowder. Prepare Oster’s Double Contact Grill or any grill you have at home to medium-high heat. Arrange bell peppers, skin side down, and corn and grill 5 minutes, turning corn occasionally. Add tomatoes; grill an additional 5 minutes or until vegetables are slightly charred. Remove from heat; cool 10 minutes. Coarsely chop tomatoes and bell peppers; place in a medium bowl. Cut kernels from ears of corn; add to tomato mixture. Heat oil in a large heavy-bottom saucepan over medium heat. Add onion; cook 7 minutes or until tender, stirring occasionally. Stir in tomato mixture; cook 3 minutes, stirring occasionally. Increase heat to high, and stir in broth. Bring to a boil. Reduce heat, and simmer 30 minutes or until vegetables are tender. Use Oster’s stick mixer and process until smooth or chunky, depending on how you like it. You can also pass it through a sieve for a smoother consistency. Place pan over medium heat; cook until thoroughly heated. Stir in salt and black pepper. Ladle about 1 1/2 cups soup into each of 6 bowls; top each serving with 2 teaspoons cheese and 1 teaspoon chives.